A lifetime of legal experience. Jacqueline N. Davis has more than a decade of experience practicing law in South Carolina and an even longer association with legal professions. 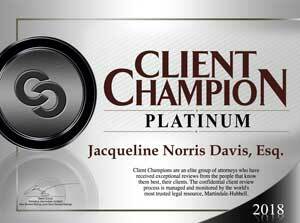 Jacqueline Davis is a graduate of Trinity University in Washington, DC. She completed her Juris Doctor at the University of South Carolina. She has been practicing law in York County, SC since being admitted to the South Carolina bar in 2006. Her interest and involving in the law reaches back further than law school. Ms. Davis served as Executive Director of the Women's Bar of the District of Columbia from 1997-1999. In addition to representing clients in South Carolina courts, she is also a member of the federal bar, practicing in federal district court and appeals court. She is a member of the American Bar Association. 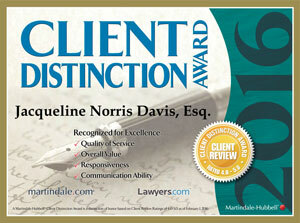 When she isn't helping clients with their legal needs, Jacqueline enjoys horseback riding.